The Multi-Mover is your transport solution for large over sized loads. The (4) 10” No Flat Wheels provide you with a peace of mind that you never need to worry about flat tires, reducing down time. New and improved, welded one piece frame makes the cart even more durable, extending the lifespan of your cart! The folding foot plate provides the ultimate support for oversized loads. Move akward bulky items with confidence and ease. 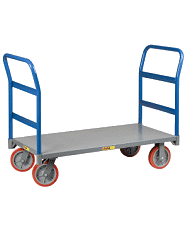 The hand truck is fitted with large four 10" Flat Free Wheels to carry large heavy loads up to 750 lbs.! Outside Wheel Base 31 1/2"